I was lucky enough to be in New York City on the opening day of Christo’s installation “The Gates” (2005) in Central Park. It was truly an inspiring site to see. Like an army returning victorious, courageous orange gates with billowing, triumphant flags flying marched their way through the park. I was filled with awe and a strange sense of hope and renewal. From the images I captured that morning I developed the series TRIUMPH OF THE SOUL. 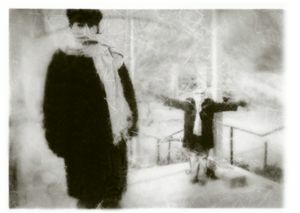 In the darkroom printing of this series I explored printing options by using tissue papers and sheer fabrics which yielded photographs that displayed a dream-like esthetic. 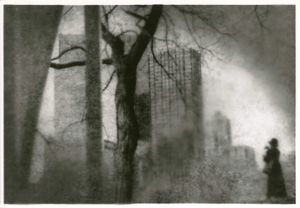 Caught in the Past, (Photo gallery for TRIUMPH OF THE SOUL) the first image I printed using tissue paper, appeared to have ashes floating in the air—shockingly evocative of the aftermath of 911. While the world was touched by many emotions—fear, anger, sorrow–to name a few, my response was mostly sorrow. In retrospect, I found that my own distress over what happened during 911 bumped up against my personal, buried grief. 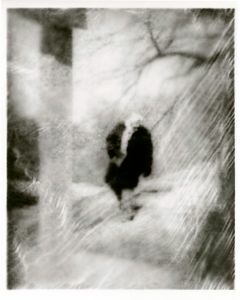 A vague melancholy—barely beneath the surface of my awareness–began to show itself in the images of this series. While the series was intended to reference a collective response to 911, it also struck a cord in me about my search for the triumph of my own soul.